… Works wonders whether you use HWE or a Low Moisture pad process. We use a unique process that gives our Licensees the edge with less down time for Hotels and private homes; carpets are “dry in minutes not hours” and mattresses undergo our thorough 4 stage dry process. 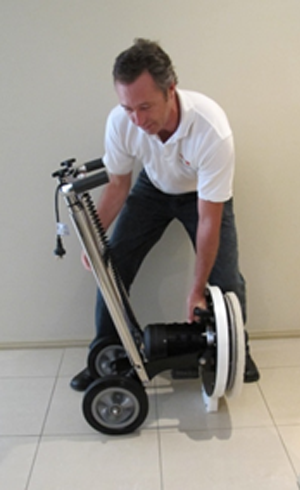 After recognising the need for an Australian Built, low moisture Orbital Machine, that was gentle on carpets but tough on stains, our ORBITtech® multi – purpose cleaning machine was developed. We are growing a Network of Licensees who care about your families’ health and sanitising your mattresses and carpets. We service Domestic homes & Hotels, B&B’s, Emergency Services, any where there are mattresses, using our advanced dry process, along with our fine range of SAFE2use® products. Our Operators are the preferred technicians for The Healhty Hotels Group® and because they are Owner/Operators they take the sanitising process seriously, and take great pride in their work. They use only the best SAFE2use® products, making the process safe for your family’s health and they give a 100% Guarantee with their work. Using the latest “Low Moisture Process” your carpets will be dry in minutes not hours. 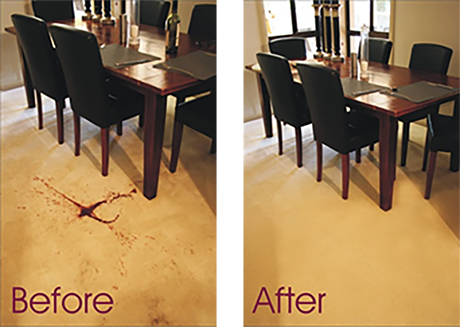 Our technicians give the carpet a thorough vacuum first using an extremely powerful system, this will give you the best result when the Encapsulation treatement is applied, reducing recurring stains. Hotels love this system because of the quick drying time, reducing their down time to rent out the rooms after they are cleaned and with the absence of metres and metres of ugly hoses running through the property, it is definitely an advantage to use the dry process. The ORBITtech® sytem is very quiet and this makes it popular in Hotels, Hospitals and Retirement homes. Learn more about our process on the following pages. Just check out these before and after shots! Check out our video featuring the NEW ORBITtech® Australian made Orbital low moisture cleaner, light weight, lighter than any other machine in its class, quiet, easy to operate and adjust, looks awesome and will handle everything from carpets, hard surface cleaning, buffing, polishing, stripping, sanding etc. Made out of stunning Australian Stainless Steel… this is the toughest, best looking machine on the market. The BEST EVER low moisture encapsulation solution is here! Many customers are now demanding to know what is being used on their carpets, whether it’s safe for their families and they want to be assured that it doesn’t contain any harmful residual chemicals. We want to give you access to this great Encap with its powerful built in stain removal that will make your job EASIER for you. For use with Rotary pad machines, such as Orbital machines, Cimex, Polivac, Karcher, Windsor and other portable low moisture pad/bonnet cleaners… AND HWE machines. Try it yourself to see the results, you will be amazed! SAFE2use® Encap will cut through dirt like nothing else! Don’t you wish you’d know this years ago……………..
People are so much more aware of Allergy and Asthma triggers in their homes today and the days of getting the cheapest operator out to your house no longer makes sense, the toxicity of the cheap chemicals they use combined with the recurring stains, makes you realise that the saying “You get what you pay for,” rings true. Have you ever chosen one of these budget carpet cleaners only to find the stains are back the next day, the house has a musty smell and the carpets take 2 days to dry out properly? People don’t have time to wait at home all day for the carpets to dry, with our system, they are dry to walk on in minutes not hours, this is due to modern technology. The exclusive encapsulation product and process that we use will give you a fabulous result, without wetting the carpets. Our point of difference is that we CARE about your environment, your family’s health along with the health of our operators that use our SAFE2use® products on a daily basis. Some companies use cheap, toxic chemicals and when they have finished with your carpets and mattresses, you have no idea what has been left behind. Your family should not be subjected to these toxic chemicals; do you ever wonder how Asthma and Allergies are triggered? Many people have removed their carpet thinking that it will cure their allergies and remove dust mites, this is not the case, the dust then blows freely around the house with nothing to capture it. They just need to be maintained properly using safe, environmentally friendly products, so that you can enjoy the soft, plush experience they offer without the contamination. Don’t let people tell you that their products are “chemical Free” even soap contains chemicals; it all depends on the safety of the chemicals they are using. And that’s where our SAFE2use® range of products comes into play……. Equally, don’t let scaremongers tell you that all chemicals are dangerous, they are NOT and we need them to protect us, we just need to make sure that the chemicals being used in your home or in our Hotels and workplace are SAFE to use. We are sure you will love our SAFE2use® Encapsulation Solution, the fragrance that lingers in your home is something our clients comment on all the time. That clean, fresh, just cleaned smell of your carpets and furnishings coupled with the great results you will get from this process, will have your customers coming back again and again. Our fully trained Technicians use our low moisture 6 stage carpet process in conjunction with our Australian built ORBITtech® machines to give you the best results. No more waiting at home for hours for your carpets to dry, here are some other benefits of our 6 stage process. 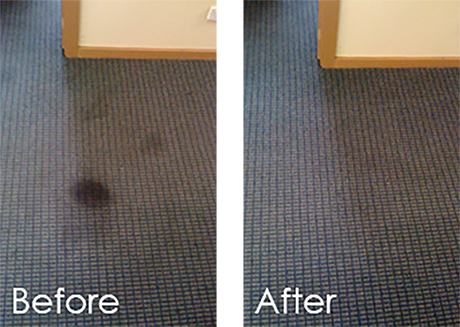 • Eliminates the problem of over wetting the carpet – the carpets are Dry In Minutes Not Hours! • The last stage of our Carpet process is to Groom and Reset your carpet making them look and smell great. • Your mattresses can be treated as well on the same day. Our Licensees take Mattress Sanitising very seriously, using a four stage process to ensure your ongoing protection. It is so important to extract the hair and skin particles along with dust mites and their excrement thoroughly from the mattress, this means using a high powered extraction machine. Normal housekeeping vacuums are not capable of removing enough of this debris. Our Licensees flip the mattress and extract and treat both sides, including the ensemble (or slats). Other companies may not follow this procedure, leaving behind harmful dust mites, and bacteria in the mattress, rendering their cleaning system “useless”. There is no sense in trying to sanitise a surface that is not 100% clean, that’s why our extraction process is so important. Both sides of the mattress need to be extracted as the mixture of hair, skin particles, dead dust mites & bacteria naturally filters down through the mattress over time, into the ensemble, the mattress is not considered “sanitised and clean” unless all of these surfaces are treated and extracted properly. When you think that most people spend $70+ taking their dog to the groomers several times a year, and yet for about the same price you can have a beautifully sanitised mattress and pillows! Unless you suffer from severe allergies, twice or three times a year should be enough. People tell us that having these triggers removed from their mattresses and carpets, relieves the symptoms of their Allergies, such as sneezing, red eyes, wheezing and sore throats and that makes sense doesn’t it? Another thing to consider is that we clean everything else in our homes on a regular basis and forget about the mattress, when we spend 1/3 of our lives in bed! There is a significant difference between Orbital power and Rotary Bonnet/Pad cleaning. There is more agitation with the Orbital system, than the Rotary machine, resulting in a deeper reaching clean, the Orbiting head with the correct pad attached not only does a great job of cleaning the surface of the carpet but has many more contact points and gets deep down into the carpet fibre with its dual oscillating and pulsing action. You will find it easier to win over the contracts because there is no need to clean as often as with the conventional hot water extraction (HWE) system of cleaning. With the ORBITtech® system, the carpets and rugs stay looking cleaner for longer, the stains won’t re-appear the next day as with some Hot Water Extraction cleaning systems, which means you will be very popular with your Commercial cleaning customers, you will be able to sign them up for a 3 – 4 month maintenance program, instead of the “usual” cost of twice a month treatments. The carpet will be dry in minutes, not hours and you will be saving Motels and Hotels on the down time of renting out a room. Ideal for private homes too, with everyone leading busy lives, the householder doesn’t want to stay at home all day with windows open trying to dry out the carpet. You will save water too, that’s great news for the Environment. No massive hoses pumping litres of water into the carpet, making the area unsafe, smelling damp and slippery in the hard surface areas adjoining the carpets and giving the dust mites an ideal breeding environment due to the excess moisture left behind in the carpets. The ORBITtech® is safe and quiet which makes it ideal for use in Hospitals, Motels, Nursing homes and Retirement Facilities. These machines are an all-in-one carpet and floor cleaning system. 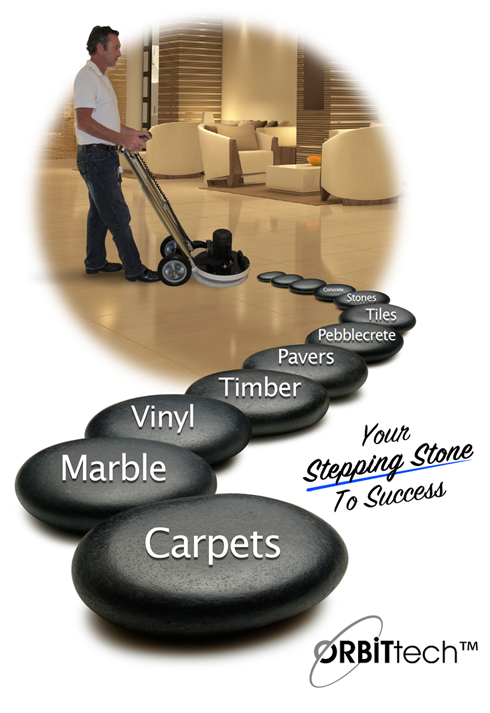 They will scrub, polish, strip wax, clean timber and laminate floors, vinyl, tile, concrete, pebblecrete, brick, stone and all types of carpets from residential to commercial, from wools to synthetics as well as floor rugs. As most of the Professional Carpet Cleaners out there would be aware the most important step in any carpet cleaning job is a thorough pre-vacuuming. If this step is missed or the dirt is not extracted thoroughly, you won’t get a good result, up to 95% of the dirt in a carpet can be successfully extracted with a good professional extraction system, which is important, if you leave the dirt in the carpet then add moisture, you will create mud! Why make your job harder? If you want great results, start with the most powerful extraction machine you can find. The ORBITtech® cleaner is a top of the range machine, used along with the other essential equipment you will receive when you purchase a Biotech Hygiene License, will give you the advantage over other companies that have flooded the market with cheaper equipment and toxic chemicals. The general public are wise to this and the majority won’t pay for a system of cleaning that doesn’t work, with recurring stains and unsatisfactory results, they now realise that “you get what you pay for” and are happy to pay a little more for a quality job. 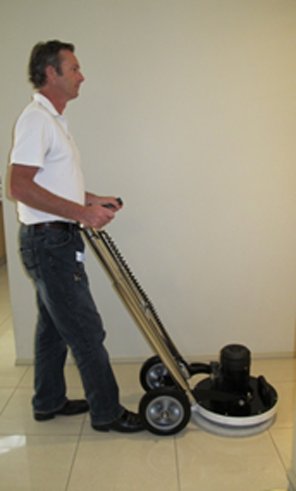 There is no comparison, when you consider the Orbital agitating deep cleaning action, its stunning stainless steel body, sturdy, compact construction, extremely low noise level, ease of use and versatility, makes this machine the most Elite carpet and hard surface cleaning machine on the market and a must have for any carpet or tile cleaning business. One of your first considerations should be the size and weight of a carpet machine; you will be lifting it several times a day. The ORBITtech® is the lightest that we know of on the market, beating the overseas imports by kilos, it weighs only 36Kg, in comparison to most other brands weighing in close to and some over 44Kg, no wonder it’s more popular when you consider the strain it saves on your back. It has been said that the Orbital Pad Systems are the next generation of cleaning. 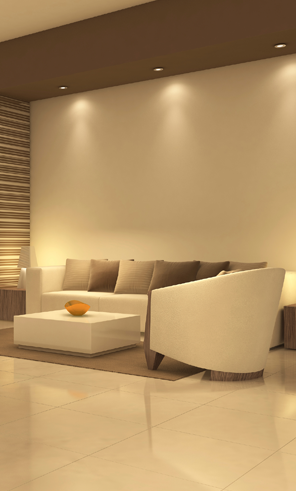 They provide high agitation and minimal wear on the carpet, (carpets are not stretched by this method of cleaning) and the fastest drying times in the carpet cleaning industry. There are many different pads to suit your needs and they will fit directly onto the pad driver, making it one of the most versatile machines on the market. The movement of this machine is pure efficiency, it is powerful on stains, gentle on carpets and rugs, and there is no comparison between the Oscillating power of this Low moisture system and the old single stick rotary buffer. Once you see how easy it is to handle compared to the old Rotary scrubbers you will know what we mean. With its stunning Stainless steel good looks, no power coated paint to chip and crack, it will look great for years to come. It has super easy controls and safety has been a premium consideration in the manufacturing of this machine, you will notice there are rubber sleeves on each handle. It has easy height adjustment, Folds down easily to transport, no hinges to break or get your fingers caught in. Australian made, no more waiting weeks, sometimes months for imported spare parts, we understand that time is money in this business and buying an imported machine can mean long frustrating waits for parts and a huge loss of income. The ORBITtech® is made in Queensland, Australia, and if your machine should break down in the future or need servicing we will have you up and running in no time flat. There is no need for extra bells & whistles that will weigh you down; this masterful piece of equipment is simple, sturdy and the lightest of anything in its class. How do you know which Moulds are “Killer Moulds”? How do you fix your Mould problem without spending a fortune? Trying to find a Mould Removal product that is effective but still safe for you and your family can be difficult. A lot of Mould Removal products on the market contain bleach, apart from the damage the bleach can do if it drips onto your carpet or furnishings, it doesn’t kill the mould, it just changes the colour (bleaches it) and that is why the mould returns. Mould has become such a health problem that is being hailed as “The Asbestos of a New Generation” in the United States and a rash of lawsuits totally $600 million is pending. This is mostly due to Landlords who don’t want to deal with the mould in Rental properties, the mould has caused significant health problems for the tenants, to the point where they have had to move out, but it has also caused damage to the buildings appearance and structure. Our SAFE2use® Mould Removal and Mould Prevention product will stop the mould from coming back for up to 12 months. * provided the source of the mould problem has been fixed. Our external mould remover does an amazing job of removing mould from driveways, pavers, rendered walls, timber, bamboo and rendered fences, pebblecrete, tiled roofs. To give you an example of the labour saving benefits of using SAFE2use® products, once you have used the product to remove the mould from your paths, driveway or roof, you won’t have to worry about it for up to 12 months, which will also save you money on your water bill; you won’t need to repeatedly use your water blaster or hose to maintain your property. Cutting down on water usage helps your pocket and the Environment. Mould can make you and your family very sick if it invades your home and it can be very difficult to get rid of and keep it away for any length of time. Not all moulds are “Killer Moulds” the most deadly is Stachybotrys, it is black in colour. But many times, the mould that you see will be a combination of moulds growing on top of one another, making it difficult to identify what you are dealing with. It also depends on the persons’ reaction to the mould, some moulds can trigger an allergic reaction and can cause respiratory problems if it gets into the lungs, especially when it is disturbed and becomes airborne. The elderly and babies are most susceptible when mould is growing in your home. But there have also been many documented cases where workmen attempting to remove mould, have ended up with mould spores embedded in their legs, their eyes, their feet, with sickening consequences. Once the mould is disturbed and becomes airborne it can produce toxins that can compromise your immune system once the spores enter your Respiratory System. Getting rid of the mould in your house can be expensive, if handled by a qualified Mould Remediator. These professionals do a good job; they will run tests to find out what type of mould you have in your house. They will use very expensive equipment to test the moisture in the walls, and the extent of the contamination in your home. They will test the Air quality in the rooms affected to inform you of the levels of mould toxins found. That’s great, if you can afford it! But if you don’t want to take the risk and deal with the Mould Removal yourself, give us a call, we can find you a trained mould removal technician to help you, who will come prepared, with all of the safety gear, knowledge and expertise, you will be pleasantly surprised at the very affordable quote. However, if the job warrants more complex testing or equipment, they will happily recommend you to a Mould Remediator in your area to assist you. Are you thinking about owning your own carpet/mattress cleaning business and looking for a better method to give you the edge on the competition? We are looking for more operators to service our Healthy Hotels Group clients, CALL US ON 1300 79 91 93 OR FILL OUT THE ENQUIRY FORM BELOW AND SOMEONE WILL CONTACT YOU. Hello, my name is Darren and I operate in South East Queensland. I was trained by Janice when the company first started, when we were just doing Mattresses, now we also do Carpets, Hard Surface cleaning and Mould removal. I win a lot of contracts because of our procedure and the exclusive, good quality products we get from Biotech Hygiene. I feel really happy with the service I have received over the years and I would highly recommend them as a Company. Their systems and equipment work really well, and if anything does need replacing, it is much quicker and easier because the machines are manufactured right here in Australia, this is important to me, I can be back on the job in no time. Anyone wanting to get into this field would really benefit using this proven modern system that is very much in demand now, with the low moisture process, the down time is almost nonexistent, which gives me the advantage with Motels and Hotels who need the room ready in minutes not hours. Very happy indeed! Hi There, My name is Paul from Nth Qld, I am pleased to say that my business is growing rapidly; I have just recently put on an extra van and two extra staff, to cope with all of my commercial contracts. I have to say that dealing with Biotech Hygiene has been a terrific experience, and in particular a key point of difference that I have been able to achieve is that through the outstanding products that Janice has available for our network, I been able to establish my company and branding in the market place and outperform my competition in terms of efficiency, results, and customer satisfaction. Janice has been a valuable support contact at all times and has always been available to take phone calls and address issues we have in the field and I cannot emphasise enough how this key factor alone gives me and other operators in the field much needed confidence and peace of mind. I feel that Janice is an integral part of my growing business and I really appreciate her encouragement and support, nothing is too much trouble. Hi there, my name is Rhys, I love the freedom that this job gives me; it has allowed me to spend more time with my daughter, which is very important to me. 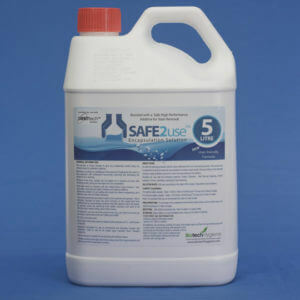 Biotech Hygiene’s SAFE2use® brand has been invaluable to me as a point of difference to some of the toxic and harsh chemicals used by other carpet cleaners out in the field. I find time and time again that people with Allergies and Asthma are looking for healthy alternatives in their homes and SAFE2use® delivers that product. The backup service that Biotech Hygiene gives us as Operators has been great! They have been reliable and quick to respond to any concerns. Yes, I would highly recommend being part of the Biotech Hygiene network of Licensees. G’day, I’m Paul and I’m from Victoria, I was trained by Janice when I first started in 2007. My business has grown at a steady rate. I have my regular contracts both Commercial and Domestic and I have been very happy with the level of service I have received from Biotech Hygiene. They have the BEST Encapsulation product out there. Everyone loves the subtle fragrance and it gives me confidence knowing I can achieve really great result and remove so many marks with ease. I rarely have to use anything else to remove marks. I love the SAFE2use® range of products; they give us the edge as operators. I can honestly say that I believe you will receive the best training and support when you join the Biotech Hygiene team. Biotech Hygiene is proudly Australian owned Company. We have been providing machinery, accessories and chemical solutions to our Licensees since 2009.